Just look around you — at the people crouched over their phones as they walk the streets, or drive their cars, or walk their dogs, or play with their children. Observe yourself in line for coffee, or in a quick work break, or driving, or even just going to the bathroom. Visit an airport and see the sea of craned necks and dead eyes. We have gone from looking up and around to constantly looking down. Andrew Sullivan, I Used to Be a Human Being. I read not too long ago that people are experiencing new kinds of neck strain because they’re always slightly bent over their cell phones. There are so many articles about our addiction to distraction, and specifically our smart phones, so I don’t think I need to convince anyone of that here. I struggle with disconnecting, and have been finding lately, that as a result, my thoughts are scattered, and I can’t focus for long periods of time. I’ve come to expect interruption. I’m not going to knock social media because I myself have found genuine connection there on occasion. However, I do feel the conviction often when I’m looking at my phone or computer screen, that I’m living in a “virtual world” of mostly my creation- my friends, the publications I choose to subscribe to or “like,” carefully crafted personas rather than flawed people. It’s almost as though I am literally wearing virtual reality glasses. Every now and then, I look up and understand, “Oh, that’s my actual world in front of me.” But the truth is, sometimes the real world in front of me is too real, too wild, and too demanding. Instead of waking up in bed and stretching, I often ready myself to face the day by grabbing my phone and rationalizing that I’ll just check email and Facebook, my Dictionary Word of the Day, and read the NY Times headlines. Sometimes in my bedroom, darkened by blackout blinds, the screen light on my phone feels nearly blinding, but I squint and read on. What most concerns me lately, though, is the false sense of an interior life that scrolling through feeds and articles gives me. My interior life should be reserved for, primarily, my thoughts and reflections, not the ingestion of hundreds of other articles, studies, suggestions, comments, and arguments. And yet, time spent looking down at my phone or computer screen has usurped much of what was previously interior time. While there are many theories about the best way to “detox” from phone addictions and social media addiction,(Andrew Sullivan, who I quote above, went on a detox retreat) I think maybe just making it a goal to look up, rather than down, is a great way to return to your interior life and the real world around you. On my daily walk, my eyes are drawn to all of the tall trees around the walking path. In this screen-less time, I mull over writing projects and envision their structure, pray, or even just talk out loud, breath deeply, and sigh. Now that we’re entering fall, I often just watch the leaves take their graceful journey downward. Last week, as I returned home from an appointment and a few errands, feeling slightly defeated at the lack of progress on the day’s to-do list, I took a deep breath, and looked up before going in the house to unpack the groceries. 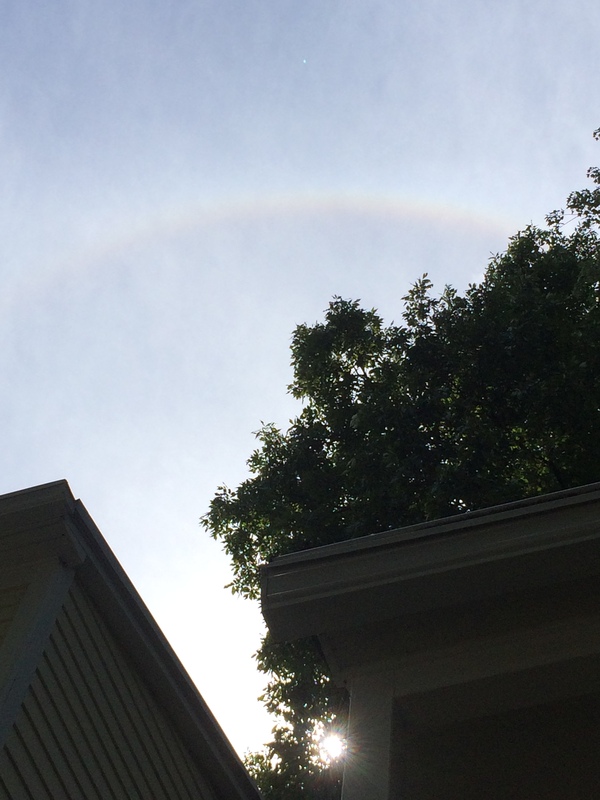 Directly over my head, so high up in the sky, I had to lean back until my head was parallel to the ground, was a rainbow encircling the sun just visible between the two trees whose branches arched above me. This time I regret that I actually did get my phone and take a few photos of the rainbow. But you know what? I couldn’t capture it because you can’t capture a moment—the surprise and comfort and hope that rainbow gave me—on a phone camera. The FOMO (fear of missing out) phenomena urges us on to look down, stay engaged, connected, in the know. But the real missing out, the missing out of moments, is happening every day. I don’t want to miss the moment when my child and I share the unexpected holiness of a majestic bird gracing our presence. I don’t want to miss the moments of quiet and stillness while the first autumn leaves slowly rain down in front of me. I don’t want to miss the rainbow right above me that urges me on even when the day’s tasks overwhelm me. I can’t purge screens or social media from my life completely, but maybe I can spend less time looking down, and more time…looking up. This, as always, is so timely for me! Sometimes I really feel as if you’re speaking directly to my heart. I’ve recently cut down my computer time to one hour per day in the morning and purged all apps from my phone that weren’t essential. I put the phone in a drawer upstairs when I homeschool my daughter, and basically try to stay as disconnected as possible. The rewards have been more than I could ever have imagined. I feel as if I’ve regained oodles of time, the ability to think and the ability to notice – to look. I’m working toward finding a balance with all of this, which I admittedly have not yet achieved. But am very much enjoying the journey of offline time. I read Andrew Sullivan’s article yesterday, and I open my inbox this morning to find your beautiful blog post today. Both feel like gifts. The rainbow was the icing on the cake. Thank you, as always, for so eloquently inspiring me. I love the idea of putting the phone in a drawer. Last year during National Unplug Month, I sent away for a free little “sleeping bag” for my phone. 🙂 It was cute, but hasn’t helped much! 🙂 I think sometimes a real detox is the only way to go. I always go offline during Lent each year, and it’s so good- I’m thinking of adding another offline time in the fall. I wonder the same about photographing. I think on the one hand we’re creating art, something beautiful from a moment or experience- much like writing. On the other hand, some moments don’t need to be blogged or photographed and are more special when they’re not. I guess it’s learning to discern which is which. I’m so glad btw (it was late and I left a very short comment last night!) that you got to see Glennon. I think she has an important ministry about authenticity- though she’s probably not everyone’s cup of tea.